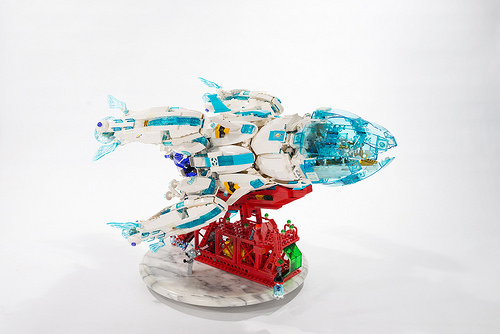 It’s always great to see a first-timer in the online fan community introduce themselves with as sweet of a build as Michael Kanemoto has done with his Chrysalis spaceship. The builder says he spent a few hundred hours over the past couple of months perfecting his design, and I’d say the effort was well worth it. This is a gorgeous and sleek spacecraft featuring all kinds of clever design details. The colors look great and the launch pad has a nice retro look to it. But the coolest touch may be that the builder has also replicated the ship in microscale.